Ever since I can remember, I’ve always been intrigued by Victorianism – whether reading my favourite gothic literature from the 1800s or studying the history, people and fashion. It’s always had some influence on my life and decisions I’ve made (taking Gothic literature during university for example and falling in love with the classics from Mary Shelley’s Frankenstein to Emily Bronte’s Wuthering Heights not to mention my ever-deepening love for high necklines and detailed lace)! So imagine my excitement last year when watching the shows coming out of New York, Paris, Milan and London. In a bold move away from the androgyny that we saw from previous seasons, SS16 seemed to fall into a more natural feminine place filled with florals and pretty ruffles, choosing to go for a more archaic aesthetic than the more contemporary pieces we’ve perhaps seen on the High Street before. Alexander McQueen’s Paris show was stripped back, making the dreamy ruffled pieces and young, innocent-looking models create even more of an impact. Perhaps it’s my love of stories and history that made me fall instantly in love with Erdem’s London show. Inspired by Prairie Madness, a condition given to mid-western women in the 19th century, Erdem’s collection managed to combine feminine strength with style using delicate embroidery and fantastic, sometimes exaggerated ruffles to give us a sense of what these women may have taken with them, nodding to this summer’s love of bohemian influence and nomadic inspiration. As for Alexander Wang’s Paris show for Balenciaga, well I don’t think I was the only one who was shocked by all the white, silky, luxe pieces being walked down the runway. Utterly feminine, each garment had a piece of romanticism attached to it, from ruffles to feathers, there wasn’t a single thing I didn’t like! An amazing shopping experience, Farfetch have over 400 fashion boutiques, not to mention a strong online presence, delivering everything from fashion to make-up, ensuring you can create your desired head-to-toe look. Rochas ruffle maxi dress, I think, is one of the stand out pieces on Farfetch.com and seamlessly combines my two favourite takes on the ruffle trend – the dramatic, yet feminine ruffles we saw at McQueen’s show as well as Alexander Wang’s fuss-free white colour palette. I love the fit and the fluid silhouette it creates, it’s just beautiful! Remember the metallic from Erdem’s Prairire Madness collection? 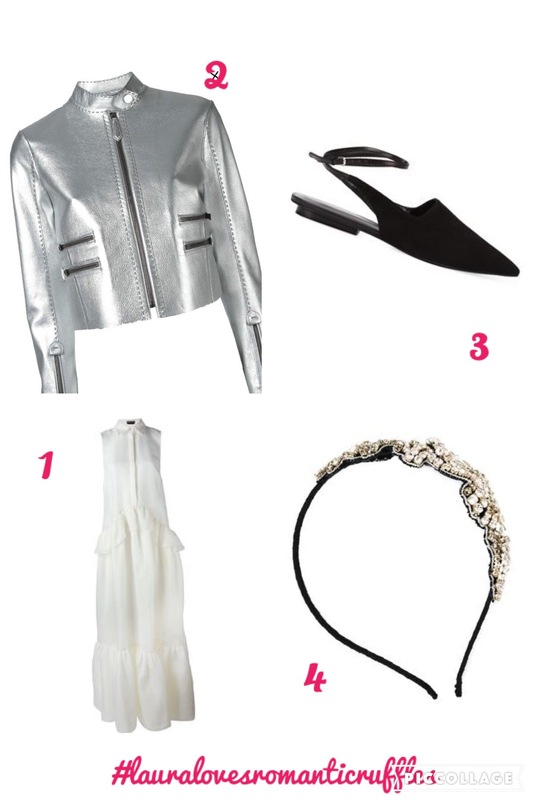 Well, I just couldn’t resist working them into my look with this Fendi metallic leather jacket. I love the contrast of clean-cut lines against the frills of Rochas’ maxi and how the futuristic silver metallic hue creates a cool contrast against the Victoriana influences. These Narciso Rodriguez sling-back ballerinas are a cheeky little pair that I took inspiration directly from Erdem’s collection, keeping this outfit very much a day-to-dark creation. Well, I’ve definitely been inspired by Rodarte’s hair accessories from SS16. I just couldn’t resist finishing off my look with a No. 21 embellished hair band for added shimmer and glitz! I’m yet to buy into my love of ruffles and am not usually one to go all out. I usually experiment with a trend – a flirty frilled top or perhaps a subtle frill to a skirt, before I fully commit. However, this maxi dress has me falling head over heels for ruffles so watch this space!